The collection runs from early handwritten lectures by Dirichlet, Riemann, and Clebsch, through almost 100 volumes by Hilbert, to volumes of Minkowski, Hasse, and Siegel on number theory, Noether on algebra, and Max Born on quantum mechanics. But the largest and most impressive of its centerpieces is the Seminar-Protokolle of Felix Klein: a detailed handwritten registry, spanning over 8,000 pages in 29 volumes, of forty years of seminar lectures by him, his colleagues and students, and distinguished visitors. These Protocols, previously unpublished, are now available digitally, as part of a project sponsored by the Clay Mathematics Institute. They constitute one of the richest records of mathematical activity in modern times." This image is from Volume I, part 2, page 113, seminar of Sunday, February 14, 1880. 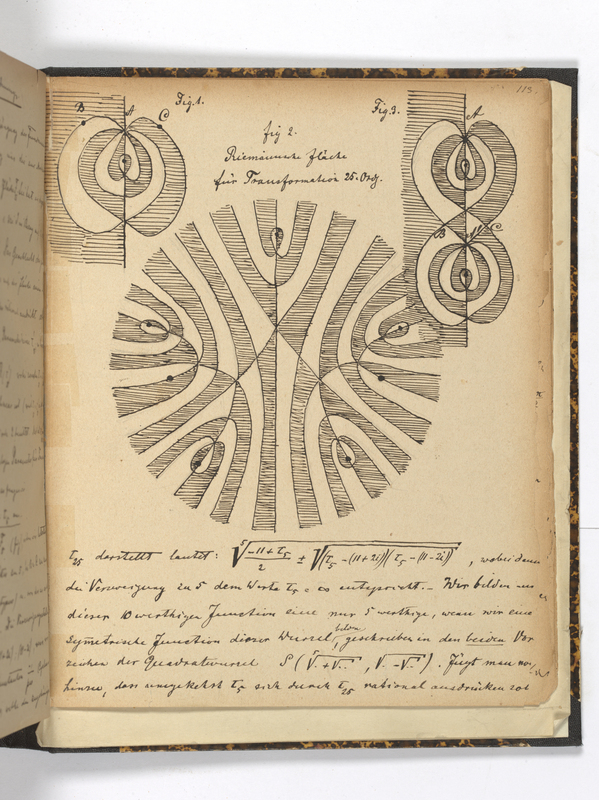 Digitization of the Klein Protokolle was funded by Clay Mathematics Institute and carried out by Libraries without Walls under the direction of Chet Grycz with photography by Ardon bar Hama. Thanks to Yuri Tschinkel at the Mathematische Institut in Göttingen for making this project possible.